He is stunning! The chartreuse tie really looks great against the blue shirt. That bike makes a great accessory too! Gotta love the orange! OH Luca! I love thee! :-) this photo brings a smile to my face! i love the grey suit with the orange bike. this guy looks awesome! The blue tie is missing!!! Very suave! & even on an ATM bike!! Love Milano, per sempre. Please tell me about this bike! omg those italians! no one can match them for effortless style. This Guy makes riding and Ugly Orange Bike look Cool..
Classic modern style, but I like it. Oh, I'm In Love with the bike ! Proof that you don't need full head of hair to be stylish. This guy looks fantastic. Pulled together and totally confident. Love his somewhat confused/quizzical expression..! The orange and grey work so well together. Very cool to see someone so immaculately dressed and riding a bike…that would NEVER happen in Orange County, CA. You'd only see someone dressed that good in a BMW or MERCEDES. GREAT BIKE. Oh, yeah, he's great too. So much confidence shining through this photograph, effortless style! Gota add, such an unusual gorgeous bike, much nicer than the barclays boris bikes we have in london!! 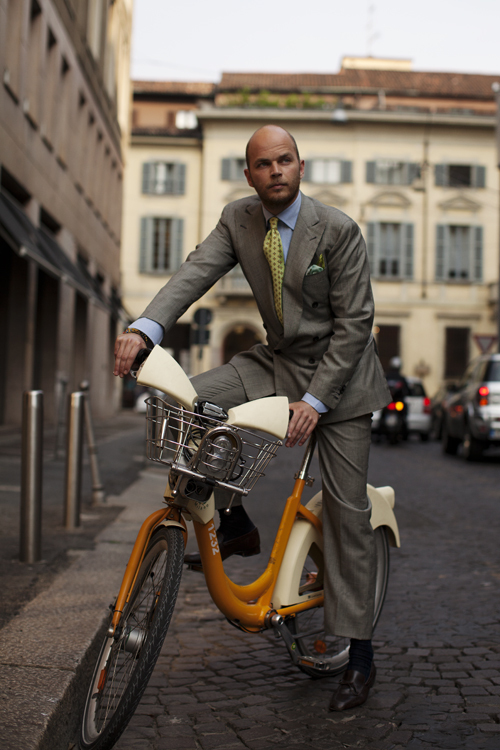 This man is to be admired, the suit, the bike, overall grooming–perfect. beautiful weather beautiful people the color combination on the motor bike you have to be Italian perfection! can you say cruiser and style? I think this proves we can! the bike is what makes it interesting… what's up with all the business men on bicycles? I don't know what's better, the pocket square or the bike! next time you snap this guy, can you please ask where he gets his suits made (I assume)? There is nothing better than a well put together man. This is his lifestyle as evident from his bicycle. Love it! This guy is fantastic. I love his style. And those bikes! Why doesn't every city have them? Incredible. I think for the guys who have to wear suits every day that they could learn more from this one photo than from whole "how to" books – the tie, the pocket square, the shoes, everything really. I'm in love with this….bike! really hot pic! I love his look, the bike, & the expression on his face. A friend of mine has a husband who use a yellow motorcycle, a cheap one, but it looks great with him. My friend told me, it's not what motorcycle, It's the personality that matters. He's really elegant. Love the bike. ^ everybody needs some Russian street fashion! He's very handsome! I also love that we for the most part have embraced the changes in men's hairlines. It's attractive to see the opposite of the comb-over. Because it's accepting who one actually is, it's downright foxy! QUIRKINESS ON THE STREES OF MILANO….ITS ALL ABOUT THE ACCESSORIES. WONDER WHAT HE WEARS IN THE WEEKEND? MMM. "Why yes," he said to the person looking down from the window, "I am indeed about to ride this bike while wearing this suit." His mighty chartreuse necktie, he realized, gave him the power to laugh off all naysayers. Stunning photography, love cycle and LOVE your blog! BikeMi! All cities should catch on this bike service. O thee Italians, always get it right. I LOVE THAT ! i love all your photos which has a suited man(or a woman dressed for an evening out) on a cycle..the contrast seems splendid. Extremely good use of colour, even if that not very racy bicycle! How does he keep the suit crease-free after riding the bike? Pocket steamer? Magical fashion-god powers? I LOVE the colour of that tie!!! Love this picture! The suit, the man, and his cool orange bike!! And kudos for catching that moment. his bike is a killer!!! Any one know the make? i think he was a natural birth… anywho- that bike is amazing- i love the handle bars area- and the colors go so great with his outfit! Luca Rubinacci, as usual on this blog, always look fantastic, pull off so good, i'm a fun of him since the first time on this blog!!! Enjoy it and Go Luca Go !!! His suit + accessories are PERFECT–but I wish he had chosen to pose on a more "grown up"-looking bike that would better match his clothes. Dang! That sure is a mighty fine outfit. Trust Luca's skill and effort to make the tailoring look so 'effortlessly' perfect, and make double-breasted and large labels look so right on a slim build. And trust Milan to make form and function look so great in a perfect city bike, when London can hardly match either with the black Boris Barclays bike. Must get to Milan one day soon. Bravissimo! Ah che bicicletta! Che style! That bike is something else. Cool guy. Amazing, great tie and shirt combo! The bike is perfectly dreamy. Love the color. is this the same guy you shot last may in milan? Love the suit and bike combination. It looks great. every single piece but not that socks please…..
Wow men are really feeling double breasted suits again. I see it more and more. Love the shot! I've already been jealous of this man's suits in numerous photos, now I must envy his bike as well? good looking man with stylish bike!! great image! This is the most conservative look I've ever seen on him, and he looks great. Luca is the best dressed of the new generation, i love his style and what is doing for the mens classic world, keep it like this Luca. the bike does everything. such a perfect color accent! This is a great suit! He is the third generation of the Rubinacci family, Tailor Brand, i really like what is doing for the new generation of the men's classic. Loafers dont mix with suits. Unfortunately, this is no exception! now i wish i can ride a bike…. The coolest on this outfit is the bike!